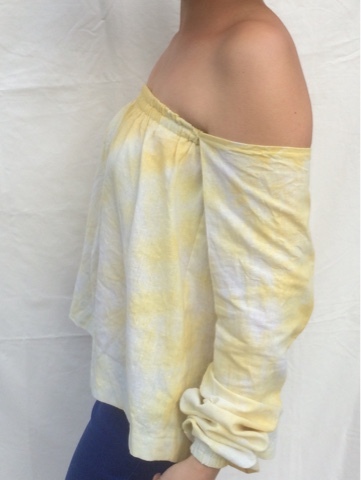 This might be the simplest, yet surprisingly, most comfortable, one yard, zero-waste, hemp shirt I have made to date! 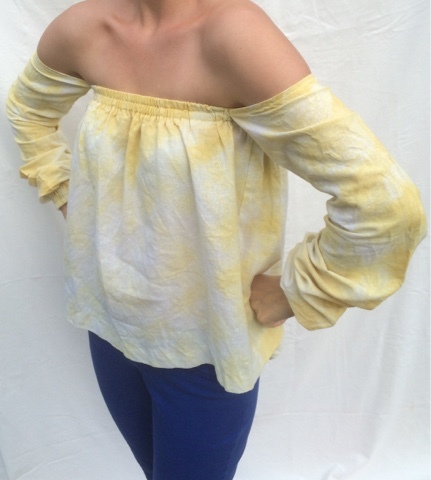 This off-the-shoulder, turmeric tie dyed top was easy to make and a breeze to wear. I have only used this spice in its dried, powdered form, it had never occurred to me that turmeric is a root when fresh. This root or rather rhizome, like ginger, can be easily planted and propagated into a beautiful, flowering plant. 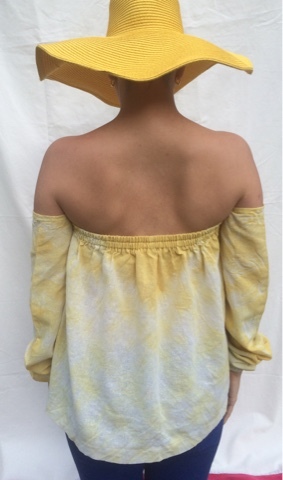 With only two cuts in the yard of fabric, this top came to be. 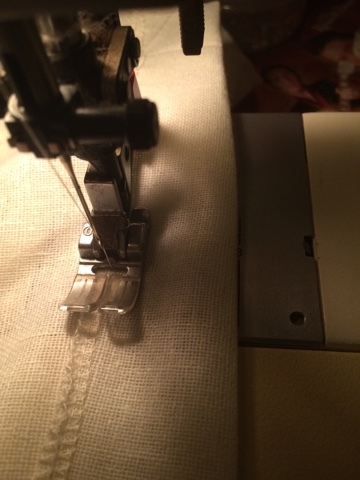 A 3cm hem on both top and bottom, plus an extra row of elastic, finished off the bust and cuffs. Somehow the snug fit of the bodice, combined with the positioning of the sleeves, allowed for an incredible ease of movement. 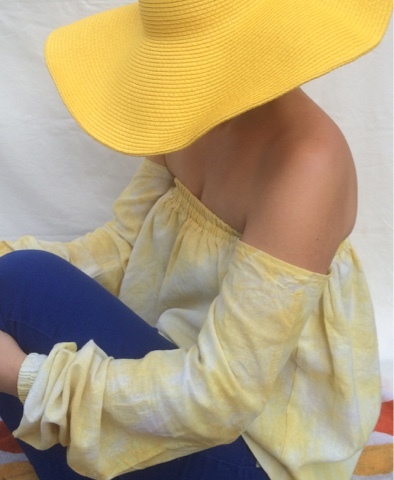 Wearing this top, I was reminded that even though I long for spring, it is still winter. Despite the off-the-shoulder exposure, the tight, wide wrist bands provide unexpected warmth all over. Our wrists are very sensitive to heat loss, since here, our veins and arteries run close to the skin. If your hands are cold, wearing an insulted wristband can greatly increase the temperature of the blood entering your fingers. Lastly, unexpected as well, my daughter says to me, when she first saw me wearing this top, "Mommy, let me fix that, it is falling off of you." Thank you to all my family and friends who's contributions were both expected and unexpected.